I have always been a sucker for consistent and smart graphical user interfaces, and work as such mostly on OS X. But I am even more of an efficiency, as in shortcuts, advocate. There are very few applications which balance the rather mouse oriented OS X interface with a smart shortcut system – Aperture being a positive example. Diametrically opposed to the Mac approach is Autodesk’s Autocad application, a technocratic and absurd mess of an application full of inconsistencies due to heritage, which still has a nerdy 1984 feel to it. Nonetheless, I love it. All comments are accessible via a command line, which enables you to just draw on a icon-free black canvas with the mouse hand, while the other hand rests on the keyboard typing out commands (we have discussed the notorious maxwan autocad shortcut system before). Purity. Zen. 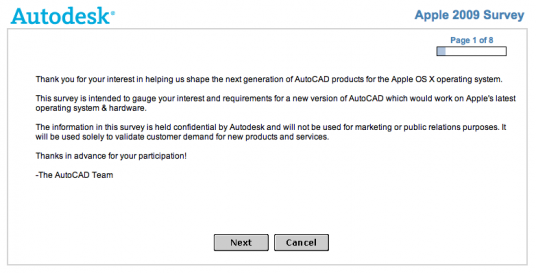 This week Autodesk put up a survey on their site asking Acad/Mac users what features they would like to see most (and first) in a AutoCAD on OS X version. The survey is detailed enough to suggest that Autodesk really means it: Acad on OS X would eliminate one of the last reasons to ever boot into Windows again, and make me happy enough to jump around. It seems to be a chance to throw all that legacy ballast over board and give us a lean Autocad. But this will most probably stay a dream, and we’ll probably get another layer of weirdness added to Autocad. But we’re enthusiastic about Acad on a Mac nonetheless, and thus urge you all to participate in the survey to give it some momentum. I am pretty excited about this. As soon as Rhino also makes the jump (the mac pre-beta has a long way to go though), there will be no reason to wrestle with a pc again.